As violence between Israel and Hamas shows no signs of abating, the sympathies of the American public continue to lie with Israel rather than the Palestinians. 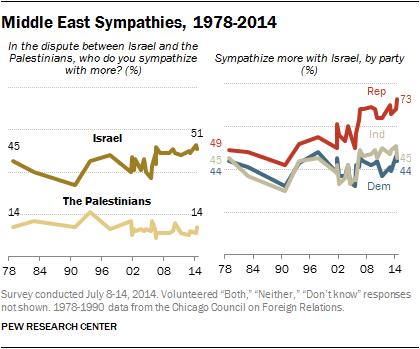 And dating back to the late 1970s, the partisan gap in Mideast sympathies has never been wider. Currently, 51% of Americans say that in the dispute between Israel and the Palestinians, they sympathize more with Israel. Just 14% sympathize more with the Palestinians, while 15% volunteer that they sympathize with neither side and 3% sympathize with both. These views are little changed from April, before the recent outbreak of Mideast violence. However, the share of Republicans who sympathize more with Israel has risen from 68% to 73%; 44% of Democrats express more sympathy for Israel than the Palestinians, which is largely unchanged from April (46%). The share of independents siding more with Israel than the Palestinians has slipped from 51% to 45%. Just 17% of Democrats, 17% of independents and 6% of Republicans sympathize more with the Palestinians than Israel. These numbers have changed little since April. The new national survey by the Pew Research Center, conducted July 8-14 among 1,805 adults, finds substantial age differences in opinions about the dispute in the Middle East. Majorities of those 65 and older (60%) and 50-64 (56%) say they sympathize more with Israel, compared with fewer than half of those 30-49 (47%) and under 30 (44%). Those under 50 also are more likely than older Americans to sympathize more with the Palestinians. White evangelical Protestants remain more likely than members of other religious groups to sympathize more with Israel than the Palestinians (70%). 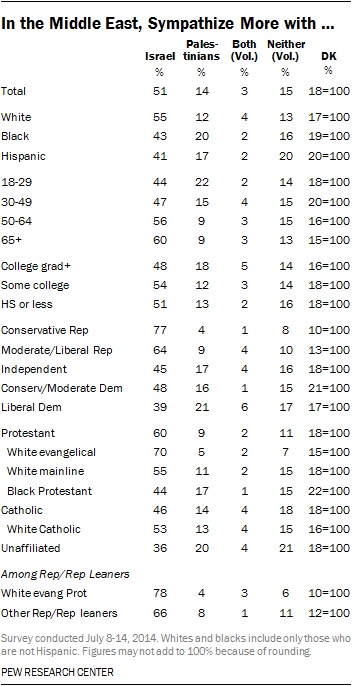 White evangelical Protestants make up nearly a third of Republicans (31% of all Republicans and Republican leaners), so this accounts for at least some of the partisan gap in sympathies. However, even among Republicans who are not white evangelicals, two-thirds (66%) sympathize more with Israel than the Palestinians. This compares with 78% of white evangelical Republicans.